Rail cars filled with chemicals overturn near a subdivision. An explosion at the manufacturing plant just outside of town causes a strange smelling smoke detectable a mile away. Emergencies involving hazardous materials can occur at any time forcing neighborhoods, or entire communities, to immediately evacuate for a day, a week or more. Local firefighters will be the first to respond. However, in some cases, they may not be adequately equipped to effectively respond to substantial hazardous materials incidents. The Regional Response Teams (RRTs) were created to support that need. The RRTs are available 24 hours a day to supplement local resources when an incident is beyond the capabilities of the first responders. 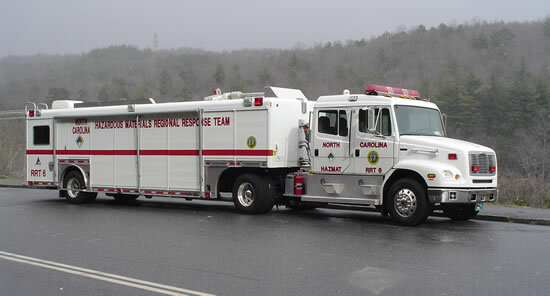 North Carolina Regional Response Teams' Seven Regional Response Teams are available to provide all communities with high quality and professional response to hazardous materials incidents in a cost-effective manner. Administered by the N.C. Department of Crime Control and Public Safety, the RRTs were developed as a resource to protect citizens and responders alike. Each team is comprised of a specially-designed and equipped truck with up to 15 local emergency response personnel that have been certified in hazardous materials handling by the standards set by the Office of State Fire Marshal. The seven teams are strategically located across North Carolina to be easily accessible to major population centers and transportation corridors. The RRT trucks are equipped with state-of-the-art communications equipment, work area, generator, floodlights, an air-pack refilling station and more than $500,000 worth of equipment and supplies. The RRT has the capability to identify unknown substances and contain any release of runoff of hazardous material until a clean-up contractor can be brought on scene. The team will then stay on scene as a mediator until the substance has been removed and the scene is considered safe. The RRTs do not take the place of local emergency response agencies, nor are they responsible for cleaning up hazardous material spills. Local emergency response agencies must be capable of containing the situation until the RRT arrives – usually an hour or two, depending on distance and travel conditions. The individual or company responsible for the release or spill will be billed for the response costs, not the requesting jurisdiction. If the responsible party cannot be determined, the cost to respond to the incident will be absorbed by the RRT program. 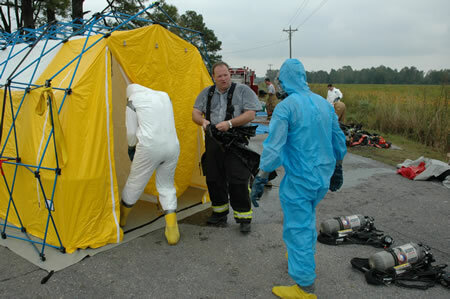 Emergency response agencies or local government officials may contact the RRTs for technical assistance or for help in responding to a hazardous materials incident if it is beyond the capabilities of the local fire department. Requests for RRTs should be made to the state Emergency Operations Center (1-800-858-0368) by the incident commander, local emergency management coordinator, or the N.C. Emergency Management Division's area coordinator. If the substance is unknown or is considered to be an extremely hazardous substance and is leaking out of its container, the RRTs are authorized to respond immediately. Response to other known substances must first be approved by the appropriate state officials. The team's state-of-the-art equipment and supplies are transported in a specially designed tractor-trailer truck, complete with a communications center work area in the rear of the trailer unit. Each unit is equipped with a generator and floodlights, as well as an air-pack refilling station. Each basic truck cost more than $148,000, and is currently outfitted with more than $400,000 worth of equipment and supplies. While funds for equipping, training and managing the teams are provided by the General Assembly, operating costs are recouped from the parties responsible for incidents to which the teams respond.